A chatbot is expected to be capable of supporting a cohesive and coherent conversation and be knowledgeable, which makes it one of the most complex intelligent systems being designed nowadays. Designers have to learn to combine intuitive, explainable language understanding and reasoning approaches with high-performance statistical and deep learning technologies. 2. Accumulate a huge set of training dialogue data, feed it to a deep learning network and expect the trained chatbot to automatically learn “how to chat”. Although these two approaches are reported to imitate some intelligent dialogues, both of them are unsuitable for enterprise chatbots, being unreliable and too brittle. The latter approach is based on a belief that some learning miracle will happen and a chatbot will start functioning without a thorough feature and domain engineering by an expert and interpretable dialogue management algorithms. Enterprise high-performance chatbots with extensive domain knowledge require a mix of statistical, inductive, deep machine learning and learning from the web, syntactic, semantic and discourse NLP, ontology-based reasoning and a state machine to control a dialogue. 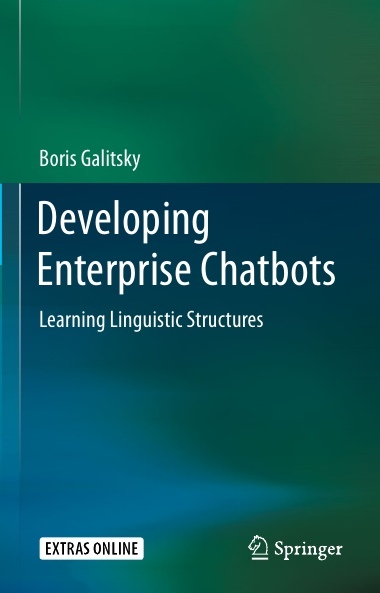 This book will provide a comprehensive source of algorithms and architectures for building chatbots for various domains based on the recent trends in computational linguistics and machine learning. The foci of this book are applications of discourse analysis in text relevant assessment, dialogue management and content generation, which help to overcome the limitations of platform-based and data driven-based approaches.